There had been a row over who would govern the new €150 million development. HEALTH MINISTER SIMON Harris has said he is thrilled to launch the new development of the National Maternity Hospital after three years of in-fighting between hospital boards. The deal to move the National Maternity Hospital to from Holles Street to St Vincent’s Hospital in Dublin 4 was agreed on this afternoon. The project was given the green light this afternoon as issues relating to governance and independence were dealt with. 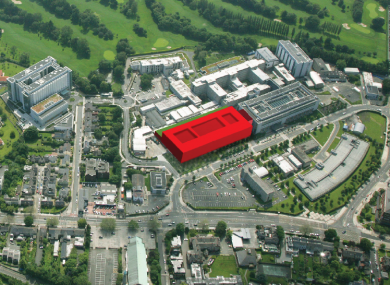 The new facility is to be built on the same campus as St Vincent’s University Hospital, at Elm Park in Merrion, Dublin 4. Minister Harris said: “I am thrilled to be in a position today to launch the development of this vital project for the future of maternity services in this country. Within weeks of taking office, I appointed independent mediator Kieran Mulvey to facilitate the discussions. I also met with both hospital boards and management and urged them to find a resolution which would enable the project to proceed. The Department of Health said the existing facility would need €25 million in short-term works if the facility was to remain at its current location, part of which dates to the mid-1700s. However, there had been issues over how the new hospital would be governed. Executives at both Vincent’s and Holles Street were at loggerheads over who was to be in control of the new centre. Vincent’s wanted a ‘single governance system’, something which Holles Street disagreed with, saying it would lose its independence. Enda Kenny, speaking at a press briefing last night, said he hoped the matter would be resolved before the New Year. The Department said the relocation would address a recommendation from an independent KPMG report, compiled in 2008, which had recommended that maternity hospitals in Dublin should be located close to adult acute services. The Master of Holles St, Dr Rhona Mahony, said the existing building – which has not received a major extension since the 1960s – was no longer fit for purpose, and the new facility was urgently needed. Email “Updated: Minister's relief as 'vital' new National Maternity Hospital gets the go-ahead”. Feedback on “Updated: Minister's relief as 'vital' new National Maternity Hospital gets the go-ahead”.